I know I had kept on putting it off, but I finally got some work done on it. Due to a class that interrupted my though process, I haven't completed it, but here's what I've got. Sealed Form: A long darkened, almost black, blade that, despite it's sheath only being about a foot or two long, is actually about 35" in length. It's hilt consists of a 6-spiked guard with has three spikes on either side of the blade pointing in different directions, and purple cloth wrapped around the handle. Shikai Form: The blade becomes slightly (about half an inch) wider while obtaining a bright purple outline. The hilt guard turns into spikes that curve in a clockwise direction, and the cloth of the handle wraps around the users hand, turning into a kind of flexible metal. The glow from this blade does cast a shadow like a normal light would. However, instead of the shadow being black, the shadows of everything in this weapon's light are white. Shikai: The Blade turns into an dark violet color with a bright purple outline. Dark Lightning: These bolts made of pure Dark Light are used in conjunction with many of Daku Migakis other abilities. Dark Lightning is not an individual ability. Dark Light Prison: (The user does not say the actual name of this move due to his acumen in using it) The user points his blade at any number of targets he wishes and the blade turns to its normal color. A split-second following the designation of the last target, the targets the user selected at are engulfed in an orb of crackling dark light from the inside out and holds the targets in place while damaging them with its dark light. One the outside, bolts of Dark Lightning dance around its surface and strike at enemies who come too close. Once the orb dissipates, the blade regains its purple outline, and the targets retain only half of their movement speed until Daku Migaki returns to it's sealed state. Dark Light Chamber: (The user can does not say the move aloud, due to having great acumen with this move) A cube of dark light that is a concentrated form of Dark Light Prison. Unlike the Dark Light Prison, however, the Dark Light Chamber is made to heal all who are inside it. It is incredibly durable. Dark Light Sawblade: The user throws the weapon horizontally, having it spin rapidly as it approachs its target. In addition to functioning as a powerful sawblade, less powerful bolts of Dark Lightning are released from the blade at random as it spins. It will eventually curve around and return to the user. Dark Light Wave: (Only accessible by the Physical Manifestation of the Blade) The user rears the blade back, and makes a powerful slash across the body, be it diagonal, vertical, or horizontal. A wave of compressed dark light is formed as the blade slashes through the air. The wave itself is as thin as paper, but can grow to be 1/2 of a mile long. The Dark Light Wave cleanly severs all that it comes into contact with, but does dissipate after awhile (so as not to cleave the planet itself in half). Bankai Form: The blade grows 5" in length to become 40" long, as well as a blade of similar length growing from the bottom of the handle. The user's arm stays wrapped in the dark metallic ribbons and each blade is has a stronger dark light emanating from it than what is seen in Shikai form. The second blade also obtains the clockwise spike handle that the original blade had. The shadows created from the light of this weapon become a brighter white. However, due to the Bankai of this weapon, it's Bankai form is only seen for a few seconds before the full transformation takes effect. Once complete, it returns to the hand of the user..
Bankai: Upon the release of Bankai, the user gains the ability to merge dark light itself, as well as creating solid objects with it, as though the Bankai gives a sense of mass to the dark light that is created by the weapon of this Bankai. Almost immediately upon it's release, the weapon appears to rapidly release a immense orb of dark light, which quickly gains size, enveloping the user and all nearby people present inside it, trapping them all in the giant orb of dark light. Inside this orb, everything and everyone is completely covered in dark light, with white shadows for every object, but they are all of different sizes and angles, and point in different directions, making it indeterminable just where the source of the ominous dark light is. If one were to try and escape by leaving the barriers of the Dark Light World, they will find themselves still inside, as the barriers of this ability are not known since noone has ever made it outside of it. Inside this Bankai, everyone inside retains all their senses, however due to the lack of sight that users not accustomed to dark light will have, most receive heightened senses to make up for the lack of sight. The duration of the bankai depends on the user. The user gains the ability to make dark light illusions that only last inside the sphere, in addition to being able to create objects from dark light, as mentioned before. Also, since the user can merge with dark light to reappear anywhere inside the orb, their speed becomes close to instantaneous movement. As a final ability, the user can choose to have the Dark Light World burn everyone inside it. The only way to see where the user is is to look for a white light shadow replica of the bankai form mentioned above. Each ability used by the user in this form shortens the time of the Bankai. The true dimensions of Bankai are not ever known, since all who see it forming are caught inside. As a final effort, the user can end the bankai, temporarily blinding the users enemies as their eyes adjust to normal light once more. The user is to be very careful here. In addition to every ability shortening the time duration of the Bankai, if the user carelessly uses these abilities too often, the Dark Light World will collapse in on itself, damaging (and killing) noone but the user himself. Your rating from me l is...........100%!!!!!! I would also like to add if someone would like to create their own weapon and "test" it, I made a chat channel for it. Sealed Form: A long silver colored blade with a red and white handle and a 5-point star hilt. The length is 37 inches long and 1 inches wide, the sheath is black and has white markings on it. On the hilt has a chain tied on it with a heart shaped piece on it. The cloth to hold it on his side is dark red and is wrapped around the sheath. Shikai Form:After the releasement is done, they hilt disappears and the handle extends to about staff length and the blade starts to bend into a scythe blade. The scythe has a 2 inch increase in width and the length decreases by 5(32) inches. The blade remains silver with a black lining around it and the handle turns black with silver diamonds running down it. Shikai: The scythe starts to glow and when the user rears it back to swing, the glow engulfs the blade and when the user swings the glow disappears and the target gets hit by an invisible blow and it badly hurts the enemy. This ability causes the enemy to be paralyzed for a few seconds, which may give the user of Shinseina Ōgama times to finish his opponent. It's other ability is split its size in half and create two tiny scythes held together with a chain that is put behind the user. Also in the first form, there is a chain with the heart piece next the the scythe's blade. The two tiny scythes have a special ability that makes this a little special than using the giant scythe. It gives extra speed, agility, and can create two tiny invisible blasts like the giant scythe can, only it is alot weaker than its regular form. Bankai Form: The scythe remains partly the same, only with the difference of the blade is slighty longer(35) and the chain on it has become black and has blades on it, which allows it to be used a somewhat of a weapon. And a smaller blade is grown at the other side of the scythe's staff. The glow that appears on the first blade now appears on the second and the blast is 2 times stronger and the paralysis has been made 12 seconds. Bankai:Furēmingu Shinseina Ōgama gains a new ability with a slight cost. He can blind his enemies with the glow of his scythe, but he will temporarily blind until he reverts from his Bankai. But there is a good side to the blindness, his senses have been heightened to where he can hear attacks a lot better than he could with sight. And now the blasts explode on contact and tiny needles fly down on him after its explodes and hits the enemy, and makes it more difficult for him to move around. 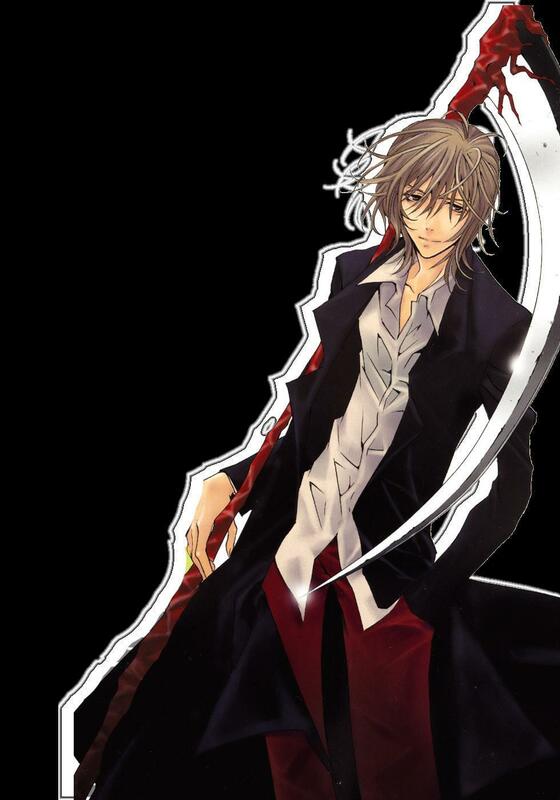 The two scythe form is inactive in bankai, since the bankai has two blades on each side of its staff. And the blast has a small chance to enflame the enemy, but there is still a chance it can, and cause severe burns on the body. Sealed Form: The blade is 1 inch wide and 36 inches long. The blade is silver with a lightning bolt going down the blade. The handguard is a jagged diamond and the handle is white and yellow. The sheath is white and has a yellow cloth tied to it and around the waist. Shikai Form: After the command is said, a lightning blast surges into the blade and an explosion occurs. When the dust disappates, the zanpakuto has turned into a claw and has enveloped the whole left arm. Shikai: When the zanpakuto is created into the claw, the user is allowed a quick strike after release. A giant lightning bolt comes from the sky and strikes its enemy. But the claw isn't just for show. The claw make the user's physical strength increase, and also it can charge the claw and shoot lightning blasts at its enemy. More powers are yet to be unlocked so far. Bankai Form: Another claw is created on the right arm. Now the left claw is yellow and the right is black. And the lightning is black and yellow and is twice as destructive. Bankai: The user's speed is the speed of a thunder clap. And the lightning that comes from the sky is now a black and yellow and has a more destructive power than its Shikai strength. Also the user can charge his/her fists longer with lightning as well with his legs. He can also shoot silent lightning strikes at his enemy that can only be heard by a slight chance. But the user has a price if he misses his enemy, he will be blind for a minute and open for an attack. This is why the user must be trained to be able to fight blind better than able to see. Sealed Description-A blade of 29 inches in length and half an inch wide. The blade is a light color of gray with a mark of the beast above the hand guard. Its hand guard is a hollowed out pentagram and silver. The handle is gray and white. Ressurecion Form- Kuro grows a extension to his white horn on his mas, which covers his left side of his face. His left arm has a blade merged into his arm above the wrist bone. The right arm has a strange black armor melded onto the skin, which creates a great way of protection and attack, but must fight unarmed, unless he uses an incantation for a weapon. Ressurecion Abilities- The horn on his hollow mask can use Oscuras Cero and sometimes Gray Rey Cero, but if his life is at near death, he can use Cero Oblivion. The blade merged into his arm is actually his zanpakuto, but with one thing different. The blade can create a reiastu coating to make it cut into stronger things, like an Espada's clothing, which is quite strong and hard to cut on some Espada. The black armor on his right arm has a few spikes on the black of the arm that extend when an enemy tries to attack from behind. His legs can also whiplash balas of the strength of an Arrancar's Cero. -Kuro's Sonido is extremely fast and can appear next to his enemy silently. -The reiastu on his zanpakuto can be layered to be stronger. -The spikes on his armor is automatic and extends when an enemy gets within 10 feet behind him. -While in his Ressurecion form, Kuro has no control over his body in the least bit. -The layering takes about 1 minute to appear. -His black armor has a weakness in the joint that connects his arm to the body, if attacked the armor will start to crack. -If incantations are used in his Ressurecion form, they will be weakened. Bankai Release:Reap the Souls of Evil, Jaakuna karitori! alrite w/e, i just got bored anyways, so in your opinion, do you like it? Sealed Form: Wakizashi, 22 in. in length. Made entirely of ivory, with a black cloth wrapped around the handle. It lacks a collar, and the black cloth extends about a foot below the pommel. Released form appearance: The black cloth is gone, and a gauntlet made entirely made of bone now covers my right arm. Released abilities: Attacks by my katana will pass through living things they strike, dealing damage to their mind equivalent to the damage that would have been dealt to their body. This damage may be seen in a person in either their personality, ability to think, motor control, speech, balance, or memory. This damage will heal, but not through normal means. My gauntlet has the ability to heal the mind, and remove afflictions of the mind, such as fear, insanity, etc. However, when it does so, it damages the receiver's body. Bankai: Appearance: The katana is gone. My reiatsu has been converted into a bone armor that covers my body. My armor has no slots for vision. While in this state, I must fight the hollow that resides in my zanpakuto for control. My speed is greatly increased, but my power stays about the same. My gauntlet's finger parts are sharp are used both offensively and defensively. I gain an immunity to kido, magic, etc. at the cost of my sanity. Shattering a piece of my armor, I transfer the reiatsu from the shattered armor into a beam of pure reiatsu. It is revealed, during this, that there is nothing underneath the armor except eternal blackness. If the entire armor is destroyed in this manor, the user dies. Any reiatsu used in the beam is lost. When the beam hits another reiatsu, both expend each other. Weakness: Cannot see, must rely on other senses. Must struggle for control, occasionally dipping into insanity and bloodlust. Unable to use kido, magic, etc. abilities. Strengths: Increased speed, no sensible reiatsu, and immunity to non-physical(Non-magic-ish) damage, attacks damage enemy's mind as well as body, resistance to physical damage. Sealed Form: A short silver blade that is 61 centimeters in length. The hilt takes extreme detail with a dark gray color and engravings carved into it, beneath the cloth. The engravings read "起こった. (Okata, meaning Arisen)" It's sheathe being highly detailed and engraved with "暮れシルバーナイト翼." She never forgets her Bankai or Shikai because of these engravings on her sword. The engravings also play part in their forms. Shikai Form: The blade turns into a katana, growing slightly in length to 74 centimeters. The blade's hilt has a gray cloth wrapping around it and the hilt is black it self. The guard turns into a ring of spikes and points out towards the tip of the blade. The engravings on the hilt, beneath the cloth, move onto the collar of the blade and they emit spiritual energy from them. Shikai: The blade is black with a silver edge detail. The collar is gold while the engravings are white. The pommel pulls out into a second blade that is only 12 centimeters and used for quick sneak attacks. The hilt itself is wrapped in a red cloth and turns black along with the blade. The spiritual energy emitting from the collar can be sent through the entire sword to be used as a powered up blade strike. Light Pyramid Attack: The blade forms a traingle on the ground around the opponent(s). They are soon surrounded by a pyramid of white light, the tip of the pyramid is connected with the tip of her sword. Ami then rises up a great distance above the pyramid. When she finds an appropriate distance, she comes down on the pyramid. The pyramid shrinks to the size of the opponent(s) and traps them in a compacted space. Ami then collides with the pyramid and cuts through her enemies. Energy Blade: The blade is wrapped with a light blue spiritual aura. The aura is similar to when Yamamoto uses his fire blade. It works as an addition to damage and to add onto the physical reach of the blade. The energy explodes as it makes contact with another blade, destroying or fracturing the defender's blade. Energy Prism: The blade is able to release a blast of spiritual energy out of the tip of the blade. The blade releases concentrated spirit energy in a small beam that reaches out towards the enemy. The energy is able to disappear in it's own teleportation and reappear again near the enemy. Final Energies: Final Energies is used in Ami Chan's final attempt to destroy her opponent. She sacrifices the blade she is currently using when she uses this and needs to have another to quickly trap her Zanpakuto in again. Ami Chan throws the blade towards her enemy and before it hits them she shouts 'Final Energies' to have the spiritual energy within the blade to explode and release it against the enemy. The force compares to the power of a level 2 Cero. Without having another blade, Ami Chan could lose her Zanpakuto forever. Bankai Form: The blade acquires the same form as Ami Chan's Shikai but also a Tanto and wrist guard on the opposite hand. The Tanto has a silver blade and a golden hilt. The hilt is wrapped with a white cloth and the wrist guard with a black outline and silver guard. A breastplate and small pauldrons are also put onto my body. Bankai: Upon releasing her Bankai a great shock wave of power blasts out of her. Any near-by foe is knocked back and damaged by the burning energy. She receives a moderate increase in speed and power. She also gains control of hollows of Menos rank. Bending them to her will, being able to use their Ceros' against her opponents. She also is able to use Cero Doble. Her Cero's are also charged up more quickly and made more powerful. Sealed Form: The blade is a long katana wielded side by side with Silver. The katana's blade is completely red as blood. The hilt is black as night and the guard golden as the crown of a king. It takes simple detail compared to Ami's second sword. Her body takes a whole new appearance upon taking her Shikai form. She turns into a woman of extreme strength and mental confusion. Shikai Blade Form: The blade turns into a blue guitar shown in the picture above. It has no sharp edges and causes only blunt damage to opponents. Shikai: The blue guitar, though now a blunt weapon, is able to use sonic waves if the right tune is played. Depending on the song or tune the attacker may be put at a disadvantage or Ami will be put at an advantage. If she uses enough spirtual energy she can cause a sonic boom with the guitar or even a sonic attack. Sonic Rings: Sonic waves mixed with spiritual energy emit from playing a tune on the guitar and attack the user. The target would have to move faster than sound in a wide radius to avoid this attack. Sonic Boom: Ami breaks the sound barrier by adding her spiritual energy as she plays a tune. The immensity of the sonic boom is enough to cut trees in half. The power of the sonic boom can be focused to a certain area. She can control the radius and immensity of the sonic boom. Making it a deadly sound attack. Song of Sorrows: Ami plays a soft tune that weakens her target's will to fight. The loss of moral can make a swift turn in battle. Song of War: Ami plays a hard tune that increases her or her targets will to fight. The gain in moral can help to shift the edge of battle to them. Song of Weakening: Ami plays a complicated tune that slows and weakens her target. The opponont will lose their ability to Sonido or teleport in anyway for a solid 10 minutes. The opponent also loses a lot of their spiritual energy over the 10 minutes. After the 10 minutes they return to normal as they were. Cloning: Ami forms clones of herself. They are more then mere illusions as some may be created with enough energy to cause as much damage as the original. Red Flash: Ami uses the ability of being as fast as light to attack her opponents. The great speed and strength behind the attack can have deathly results. She is seen only as a flash of red light when the attack makes contact with her enemy. Hidden Energy: Ami is able to hide her spiritual energy completely. If she is moving she can hide her physical being also. She can only be seen as a red flash as she attacks or when she is standinf completely still and is seen by a person's eyes. Red Aura: Ami's red aura surrounding her body isn't just for show. The aura is her entire body itself. It burns that of which touches it, she can also dettach and reattach limbs with ease. The body acts as an instant restoring field also. Bankai: Ami becomes one with the Pirate King as she activates her Bankai. 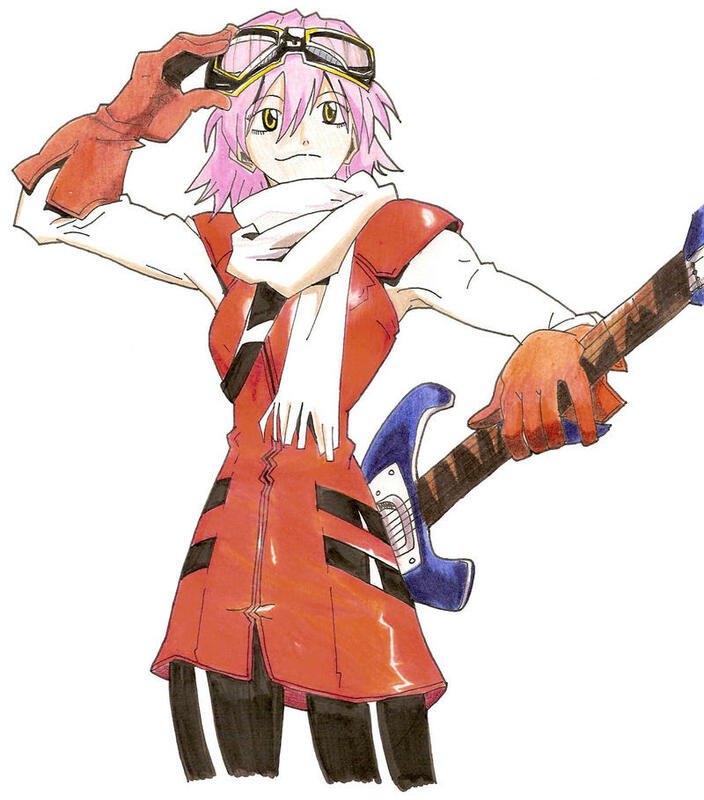 Ami holds two guitar-like swords covered in a red aura that also surrounds her whole body. The aura burns through everything with ease. While in this form she can hide her physical and spiritual presences. She can then only be spotted when she attacks because a red flash appears at the spots she collides with an enemy. Even then, she is incredibly fast. She can teleport to areas instantly on her own will. Sealed Description: A blade 35" in length, and a hilt of about 9 to 10 inches. Every few inches, the blade is a different color. If one were to look at it with it pointing to the left, the colors, from right to left would be: Blue, Red, Indigo, leg Sky Blue, Dark Brown, Silver, and bright White at the end. The edges of the color along the blade seem to meld, not giving a concise point where one color ends and another begins. The colors also seem to somewhat "swirl" on the blade, but only in their original area. Each color section is 5 inches in length. The hilt is a monotone gray, with a yellowish green cloth wrapped around it. It's sheathe is black. Ressurecion Release Command: End this! Rematador! Ressurecion Release: Immediately after the release command is called out, the blade starts to disintegrate, section by section, into a mist. The blue mist envelops my right arm, the red mist envelops my left arm, the indigo mist replaces my sash, the sky blue mist surrounds my left leg, the dark brown mist surrounds my right leg, the silver mist covers my torso, and the bright white mist surrounds my head. Ressurecion Form: My body is now encased in standard hollow skin, however, the only part where you can see it is my head, where a white hollow mask, covering the lower half of my face with jagged teeth, sits. Other than that, each of the following limbs allows for the complete control of the element that surrounds it. My right arm is now encased in a raging torrent of water, and my left arm is encased in blazing fire. My left leg is covered in of a rapidly-spinning whirlwind, and my right leg in surrounded by dense, heavy rocks. My torso is covered in a thundercloud with furious sparks. -Moderate strength and speed increase. -Allows the user to retain the use of sonido. -Elements can be combined to create several combination attacks. -There is no energy consumption to this form, but only if neither the mask or Bankai is being used. -If used with Bankai/Hollow Mask, the powers of each limb are drastically reduced, and all the disadvantages listed below still apply, and comes at a high energy consumption rate. -If any limb takes too much damage at once, the element of that limb can no longer be used until the next Ressurecion release (but can be protected by the other elements). -Neither sword can be used during the duration of the Ressurecion release. -Ceros of any kind can not be used during the duration of the Ressurecion release. -Espada regeneration can not be used during the duration of the Ressurecion release. -Balas can not be used during the duration of the Ressurecion release. -Although there is no energy consumption to the user (unless Bankai/Hollow Mask is being used), if used for a prolonged period of time, the elements will turn on the user at full power, and will kill the user. First Form- This is the normal form of Chimei-tekina handan that it reverts to after Ketsuki is done fighting. It is a silver short blade of 29 inches in length and an inch wide. It's handle is white and purple and its sheath is white with a purple cloth to hold it to Ketsuki's side. This form has no skills at all but can still be used to fight on sword on sword fights. Second Form-This is the middle strength of Chimei-tekina handan and has small physical changes. The blade has change to a darkish-purple color and its handle is black and purple. The sheath is gone in this form as well. This form has one skill called Kurai kēji, which puts its enemy in a black cage that takes away sight until the cage is broken, but if the enemy breaks it, he/she will still be blind for 10 seconds after the cage is destroyed. This skill requies a bit of energy that Kami shindes have a good amount of. Third Form- This is the second strongest form of Chimei-tekina handan, and its fastest form. His Shippū becames dangerously quick and can go from the pillars to the end of Japan and back without a sweat down his face. He also gains a sword ability called Shinin no yōna kōkei which puts him into a terrible state and makes them start seeing more of him. Basically it causes their sight to go into a giant blur so they could see about 10 images of Ketsuki coming towards them. This is basically more of an advantage for Ketsuki than for them because they could attack an illusion. Final Form- This is Chimei-tekina handan's final form and the most powerful. It gains the final ability, Shi no fināre. The blade will start to make a glow thatt starts to fill to the tip, which takes about 15 minutes at the most. When the blade is completely glowing, he can do sixteen Shippū instantly without consequence and kicks the enemy in the air and does sixteen dashes towards its enemy and cuts him/her up quite severe. But after that attack is done, the enemy's arms and legs are completely immobilzed for 25 seconds which is long enough for its final attack, Shinin no yōna bōkyaku, which creates a similar blast to Kuro Kyuseishu's Oscuras Cero, but will a little more kick. This can scatter as being used and make mini-Shinin no yōna bōkyaku which have a 1/5th of it's actual power in each one. And his Shippū is increased to incredible speed, where he is barely visible. This makes him the perfect rogue assassin. But he does have a huge price in this form, he will his powers for about 1 year and his memories for half a year. This is why he only uses this when he is in dire need of it. Sometimes he won't use it. Ressurecion Form- Kuro grows a extends his white horn on his mas, which covers his left side of his face. His left arm has a blade merged into his arm above the wrist bone. The right arm has a strange black armor melded onto the skin, which creates a great way of protection and attack, but must fight unarmed, unless he uses an incantation for a weapon. Sealed form: The hilt of the blade is wrapped in a spiral in a bright blue cloth, and the hilt has a golden covering at the end. The hilt underneath the cloth is white in color. Around the metally part of the hilt that seperates it from the blade, is a large ring covered in metallic forms of what appear to be ice shards. The blade itself is about 22 inches in length, and is a faded shade of light blue. From a distance, it closely resembles an ordinary blade in color. Rumor has it that it is slightly colder to the touch than most Zanpakutos. Shikai Release Command: All that breathe will shatter. Shikai Release Action: Melody twists the blade in her hand by its hilt, and then brings her arm up so that the blade is horizontal to her body. The arm not holding the Zanpakuto is placed just underneath the one that is, so that the arm runs parallel to the blade. The pointer finger, middle finger, and thumb are extended. The arms are held at Melody's neck level.